The social media pages monitored by the New-York Historical Society Museum & Library, which includes DiMenna Children’s History Museum, are intended to be public spaces of education and conversation. 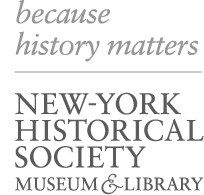 New-York Historical is committed to maintaining an accessible, informative, and civil space for those interested in the history we represent. Therefore, we ask those who engage with our social media content to abide by the following guidelines. These posts will be removed as soon as the moderator becomes aware of them. To alert the moderator to a post, please send a direct message or contact communications@nyhistory.org. Mirror our dedication to factual accuracy and evidence-based posts, with the understanding that there is continuing historical debate on many topics. Failure to follow these standards may lead to your comments being hidden, deleted, or reported. Moderators may also issue a warning, or, in extreme cases, block your account. To alert a moderator to comment, please send a direct message or contact communications@nyhistory.org. Ask questions of one another and ourselves. Learn from continuing conversations. Don’t be afraid to ask for more information, say you’re wrong, or apologize. New-York Historical is committed to linking to rich resources and articles from organizations outside our own in order to share resources and thought-provoking perspectives. Please note: New-York Historical does not control content, comments, or advertising on these sites. New-York Historical is committed to both monitoring and engaging in conversations on our social media platforms. Understand that the social media moderators check each platform at different intervals throughout the day and, therefore, are not always able to address issues or questions immediately. For immediate assistance, please contact communications@nyhistory.org. The New-York Historical Society is not responsible for conversations about our posts that take place on another account’s page. The New-York Historical Society social media moderator may remove any comment or post on our social media pages at any time for any reason at the discretion of the organization.